As winner of the "Small Machines. Big Impact." contest, Behnke will receive a new G-Series skid steer or compact track loader that will further aid his project within his community. Neil Behnke, a volunteer with the nonprofit organization Black Forest Together, has been officially named the winner of the “Small Machines. Big Impact.” grand prize. He was named the winner of the second annual contest at the 2018 John Deere Classic Chairman’s Dinner. Behnke will now take home a new model from John Deere’s full portfolio of small-, mid- and large-frame G-Series skid steers and compact track loaders, with a WorkSite Pro™ attachment. 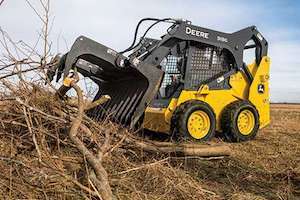 John Deere will also help two of the runner-up finalists in completing their community projects with a year-long lease on a skid steer or CTL from John Deere Financial. Behnke’s project is called “Rising Above the Ashes.” The goal is to help residents of Black Forest, Colorado, clear their land of dead trees, resulting from a destructive wildfire. "My family loves the quiet beauty of Black Forest," said Behnke. "I remember what this place once was, and I know what it can be. I want to see this community grow and thrive again." The runners-up are Kobus Appelgrijn of New Port Richey, Florida, and Anita Will of Ridgefield, Washington. Appelgrijn’s project, “Restoring Neighborhood Pride,” involves revitalizing 40 badly deteriorating homes. Will’s project, “Trailblazing Outdoor Connections,” is focused on revamping the Whipple Creek Regional Park. "These deserving finalists have inspired us with their enormous compassion and generosity," said Graham Hinch, division manager at John Deere Commercial Worksite Products. "We are eager to follow their projects and see all that they accomplish in their communities using our G-Series machines." For additional information on the rules and regulations of the contest, visit www.Deere.com/Impact.